We’ve gotten off pretty easy on the East coast so far this winter. Just a couple little dustings of snow. No major storms our way yet. Nevertheless, I love using snowflakes in design during these long winter months. I found a bunch of great ideas last year when I made a decorating with snowflakes roundup. But I was missing gift wrap ideas! So I just made my own quilled snowflake gift tags this week. I wanted to make these tags extra special. So I designed some simple hexagon shapes to use as my tag templates. And, good news… I’m sharing them with you too! Click on the photo below and print your own hexagon tags. You could print directly on thick card stock, or use the template to trace the shapes on the paper that works for you. Maybe mix up the colors too! For my snowflakes, I wanted to work with a icy, frozen color scheme. I chose pale blue, ivory and silver quilling paper. The snowflakes themselves are a fairly simple design. There’s only 3 shapes! The center of the snowflake is a coil rolled from a 3″ strip. Next, form 6 teardrops from 4″ strips. Attach these all around the center coil. To finish, roll 6 2″ strips into tight coils for the ends of the teardrops. These snowflakes are a perfect beginner project, but you can always make them a little more advanced! While your snowflakes are drying, punch a hole in each hexagon tag. It’s definitely easier to do your hole-punching before you attach your quillings. After a little experiment, I decided that I liked the hole punched in one of the corners, instead of along the side. The snowflake fits both ways, so choose what works for you! Add a little length of the string of your choice, and BINGO! You’ve got yourself some handmade gift tags to pretty-up your winter gifts! 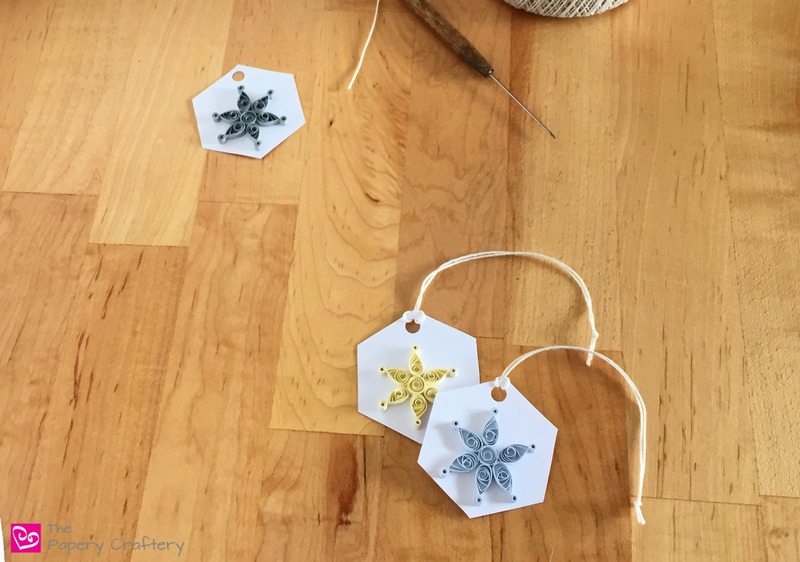 I hope you’ll give these quilled snowflake gift tags a try! You can always change them up and make them unique. Remember, every snowflake is special! These are so lovely and great for all abilities. I used to do quilling as a lunch time club at school and haven’t tried it since. This would be a nice thing to do next Christmas. I’ve pinned this post so I remember! Thanks so much! I’m sure if you decide to give it a try, it will all come right back to you. Thanks for stopping by!